As I am typin this all the way from Patna on my non qwerty cell phone, this post is gonna be short and precise. What does a man named Nitish mean to a young lad from Bihar who is a final year undergraduate student of a prestigious institution called IIT? A Hope that one day he would see himself doing his dream job while staying in his hometown. Close to his family... Close to his heart. Two keywords to be noted here. And may be the combined gratitude for all these individual hopes is what has given this man this awesome 'adwitiya' 5/6 majority from a state where politics was once dealt with bullets rather than ballots. 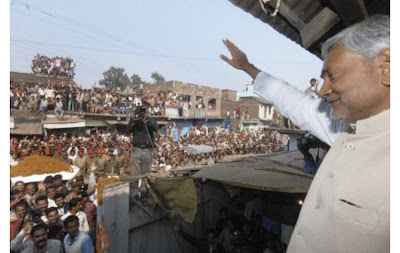 "....this awesome 'adwitiya' 5/6 majority from a state where politics was once dealt with bullets rather than ballots." This man has alone added 'development' to the vocabulary of politics. Hats off to him.